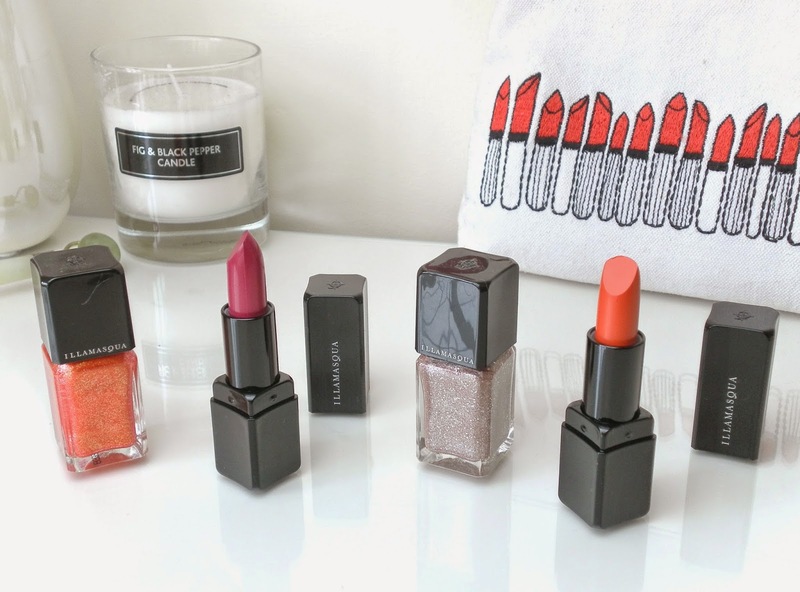 Illamasqua has been a favourite brand of mine for lipsticks, blushers and nail polishes for well over a year now, I cannot recommend them enough for the long-lasting formulas, fantastic colour pay-off and vast shade range, with shades to fit any skintone. The last few Illamasqua collections have really caught my eye and left me smitten with serious product lust. Glamore is no different, with some of the most gorgeous shades I've seen in a while, partnered with perfect finishes and brand new formulas. With three new lipstick and polish shades, the collection is full of the prettiest pinks and perfect oranges, with a touch of something extra added to the polishes to make them stand out. For those who have tried Illamasqua lip products before, you'll be happy to hear there is a new and improved formula, with a beautifully soft satin finish which glides onto the lips effortlessly. I'm not sure if this new formula will be applied to the existing lipstick range, but if it is I will be one happy bunny! I love Illamasqua lipsticks, but the current firmer, matte finish is a touch to firm and a smidgen too matte, an updated formula would be welcomed here on Tattooed Tealady! There's three new lipstick shades in the Glamore collection, Glissade*, Luster and Soaked* (Illamsqua, £16.50) Glissade is a beautiful bright and bold fuschia pink with the most lovely satin finish, whilst Soaked is a vibrant coral orange with the same beautiful finish. Lasting power? We're talking a good few hours, lots of drinks and food before needing to reapply. Perfect. Of all the brands in my nail polish stash, Illamasqua easily takes first place as my top brand for polishes. The shade range, the streak-free, long-lasting formulas and perfect finishes, my absolute favourites. The Glamore collection features three new polish shades; Marquise*, Trilliant* and Fire Rose (Illamasqua, £15) Each has a gorgeous shattered star finish, with Marquise being a brilliant vivid orange with pink undertones, whilst Trilliant is a perfect champagne. Two coats is more than enough for an opaque finish, and the shattered star finish is super flattering, especially with Trilliant. Staying chip-free for at least a week, I'm a big fan. 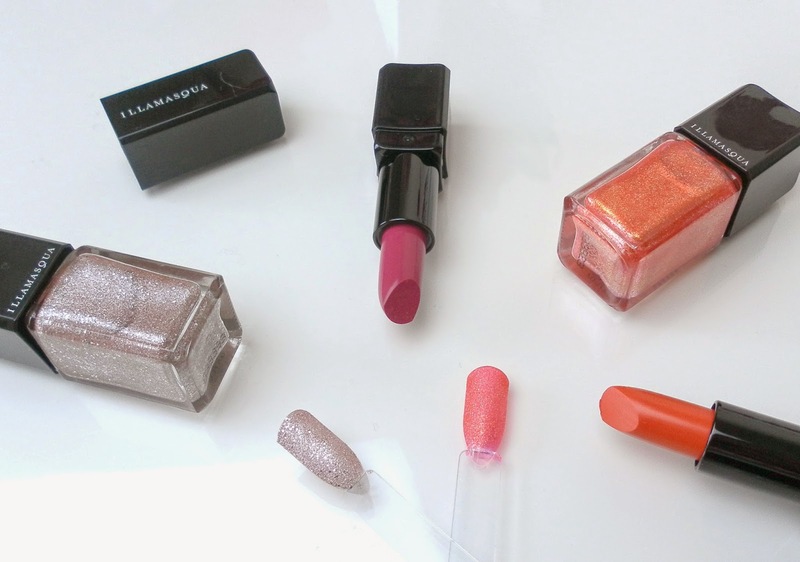 Illamasqua Glamore, the new collection to adore. Glissade looks lovely! Can't comment on nail polish as I have no nails :) but they all do look very pretty. Soaked looks like the most perfect coral orange! I love the look of Trilliant too, definitely both being added to the wishlist! Its like you read my mind! You seem to know so much about this, like you wrote the book in it or something. I think that you can do with a few pics to drive the message home a bit, but instead of that, this is excellent blog. An excellent read. I'll definitely be back. hello there and thank you for your info, I have definitely picked up something new from right here. I did however expertise a few technical issues using this website, as I experienced to reload the website many times previous to I could get it to load properly.